Esthetic medicine as a source of inspiration. VIE COLLECTION develops original youth solutions and unprecedented beauty treatment procedures inspired directly by esthetic medicine. VIE COLLECTION products stand out with high-tech formulas and advanced ingredients which deliver to the skin maximum youth effectiveness. The star ingredients and major scientific discoveries are patented and integrated in products that are increasingly innovative and effective. Results-driven approach is an essential value. 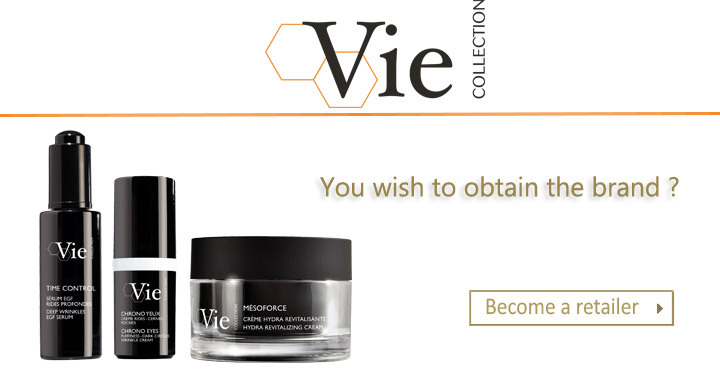 The VIE COLLECTION scientific team, composed of a panel of skin biology experts, selects the very best ingredients and focuses on the most innovative extracts. VIE COLLECTION’s scientific team creates extremely high-performance correcting formulas with optimal tolerance for visible, measured results on the skin’s youthfulness. The effectiveness of VIE COLLECTION formulas is proven and measured in-house with a series of in vitro tests in the integrated cell culture laboratory and externally via in vivo tests in independent laboratories. Professional expertise as an assurance of effectiveness. Only beauty professionals can guarantee the level of expertise of VIE COLLECTION beauty treatments and offer corresponding youth-boosting results. These medically inspired beauty treatments are performed exclusively in salons and spas and entrusted to skin care specialists. The techniques used in VIE COLLECTION treatments are inspired by the medical field and offer spectacular results after the very first session.